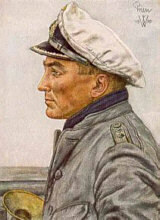 The illustrations below depict the insignia worm by Kriegsmarine personnel of officer rank. Officers wore symbols of rank on two parts of the uniform, on the shoulder and on the cuff. Standard uniform guidelines stipulated that only one symbol of rank could be worn at any one time. A drawing of Korvettenkapitän Günther Prien by the famed wartime illustrator Wolfgang Willrich. Note the shoulder bars with the two pips indicating the rank of Kapitänleutnant.